John and I were Buzzing! 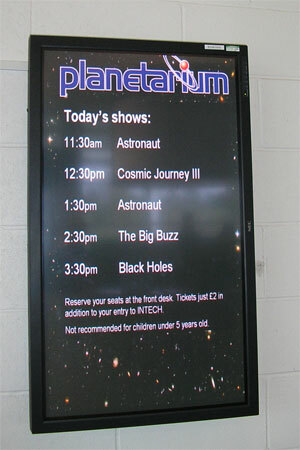 in the UK’s largest capacity planetarium on Saturday, at INTECH Science Centre and Planetarium just outside Winchester! 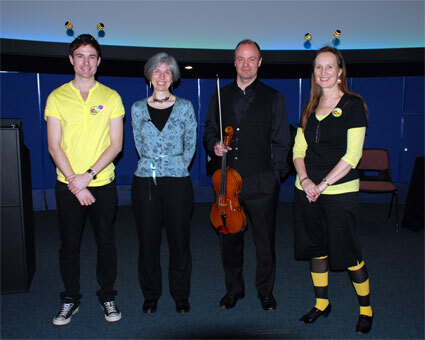 We were invited to perform a special bee version of our show as part of the Busy Bees ‘Save Our Bees” event being held there for National Science and Engineering Week. 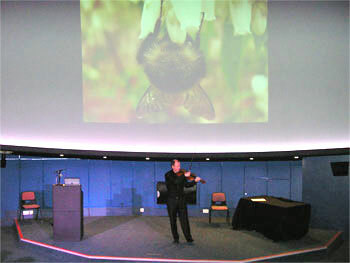 said Dan Richards of the British Science Association, who was organising the event. Thank you to Dan, and to Angela Ryde-Weller of INTECH, for their warm welcome to what was a very worthwhile and enjoyable event at a fantastic venue. John and I were really impressed with the facilities at the planetarium. If you haven’t seen a show there – go! We were also very impressed by Dan and Angela’s ‘bee’ outfits. They really got into the spirit of the day!